I was reading the yarn harlots blog the other day and she catalogued all the projects she needed to knit between now and Christmas. The list included: 2 sweaters, 2 cowls, a hat, some slippers and 4 pairs of socks! Amittedly the sweaters are baby sweaters and the yarn harlot is an incredibly fast knitter (it's the reason she is a deity among my people) but that is a frightful list. However it did remind me that I haven't started my Christmas knitting yet. That's it! I have heaps of time.... honestly I decided on the pattern a month ago. Why haven't I started it? I have also been delving into some history in my viewing and reading time. I've been watching 'The Crown' on Netflix which is an utterly fantastic portrayal of the Queens assent to the throne. I highly recommend the show, it is fantastic and a person raised in England I knew quite a bit about this era but the show filled in a fair few gaps. 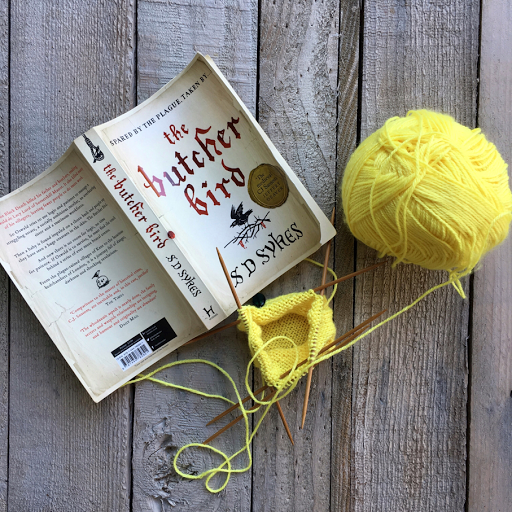 I've been reading 'the butcher bird' sadly the time I've devoted to trying to: like the characters, care about the story, or overlook the blatant historical errors, is time I will never get back. I didn't even finish it. It's woeful. Don't read it. That's so fascinating because I've been thinking about doing some historical reading. I think it's time I switch from Stan back to Netflix, I'm just not finding anything particularly interesting there. Then again maybe I haven't tried hard enough? I think Transparent is on Stan, which is supposed to be good. I just don't feel enthusiastic about it! I'm impressed you can start and finish a project in less than a month, so even your list impresses me, although if I was crocheting my easy cosy cowl, I'd be sweet. Apart from potentially having to source yarn. I'll have to go look at her blog, I can't comprehend anyone knitting socks that quickly! Socks are still on my 'one day' list. Knitted, not crocheted.